After breakfast, meet your driver and your guide and reach the Vatican Museum by private van. Access the Museum easily with your skip the line tickets. Your visit will be memorable: our guides have drawn up a route to include all the major sights as well as some unexpected surprises. See the Belvedere Courtyard with Apollo Belvedere & Laocoön & His Sons, Raphael Rooms, the Galleries of the Candelabra, of the Maps and of the Tapestries, the Sistine Chapel Pinecone Courtyard, St. Peter's Basilica and At the end, exit on the St. Peter's Square and enjoy the magnificent view of the imposing Cathedral. Today will be free at leisure. This tour has been designed to offer the best of each city visited combined with some free time to customise your travel experience as well as to take some time to relax. There are many available experiences, if you want continue the exploration of this area. 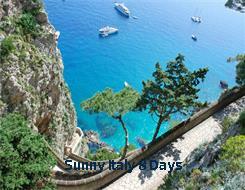 In the morning, relaxing walking tour of Sorrento, the best way to recover your energy upon arrival. You will visit the heart of the town: from Piazza Tasso to Walk along Via San Cesareo, one of the oldest streets in town, until your reach Sedil Dominova, once the gathering place for Sorrento's high society. You will see the lovely cloister here, dating from 1300 then the amazing view from Piazza della Vittoria. The walking will end with a taste of limoncello liquor in an ancient factory still located in the Old area of the town. Departure Sgl Occ. Dbl Occ. Trpl occ.